This webinar is part of BrightTALK's Privacy Insights Series and National Cyber Security Awareness Month (NCSAM). With the proliferation of the Internet of Things into every sphere of our lives, it's now more important than ever to understand the security and privacy risks associated with connected devices. With smart home devices, office tools, children's toys, even medical devices being vulnerable to cyber attacks, becoming cyber aware should be a key priority for everyone. Are the new and ever-changing data protection laws stressing you out? Feeling overwhelmed by the tidal waves of compliance requirements? Don’t know where to start? Take a deep breath. We’ll share 5 key strategic steps to help get you and your privacy program focused and release the overwhelm. Leave this webinar feeling grounded and ready to tackle the data protection obstacle courses of 2019. Jackie Wilkosz is a Manager at Aleada Consulting, where she advises clients on privacy, data protection, and information security issues. Jackie cultivates dynamic client partnerships to provide practical, actionable advice. She has specific expertise in human resources privacy and building multi-jurisdictional compliance programs. Consumers are increasingly concerned about the privacy of their personal data, and businesses are starting to pay attention. Privacy came into focus in 2018, not only because GDPR went into effect following months of hype, but also because of the steady stream of high-profile hacks and breaches, as well as media attention on how some of the biggest tech companies have been harvesting, storing and sharing user data. In 2010, International Privacy Regulators unanimously passed a Resolution recognizing Privacy by Design (PbD) as an international standard. Since then, PbD has been translated into 40 languages and included in the new E.U. General Data Protection Regulation (GDPR). These last few years we have seen data breach after data breach, as well, since the whole Facebook debacle, people are more concerned than ever in regards to who has access to their personal data. The message of Privacy by Design is more relevant than ever right now, and we need to be proactive about it! The Privacy by Design (PbD) concept calls for privacy to be taken into account throughout the whole engineering process. Discover why it matters and why PbD Certification is gaining so much interest. Join Dr. Ann Cavoukian as she discusses the origin of PbD and its 7 Foundational Principles, a framework that seeks to proactively embed privacy into the design specifications of information technologies, networked infrastructure and business practices, thereby achieving the strongest protection possible. Dr. Ann Cavoukian is recognized as one of the world’s leading privacy experts. Dr. Cavoukian served an unprecedented three terms as the Information & Privacy Commissioner of Ontario, Canada. Dr. Cavoukian currently leads the Privacy by Design Centre of Excellence at Ryerson University and is also a Senior Fellow of the Ted Rogers Leadership Centre (at Ryerson University). Many companies are developing initiatives or programs to enhance the diversity and inclusiveness of their workforce and applicant pools. To implement such initiatives and track their progress, companies must collect, use, and store personal information such as race, gender, and ethnicity. Some jurisdictions consider these types of personal information sensitive and subject to special requirements or restrictions. Additionally, handling these types of data elements presents unique internal challenges for HR teams and data analysts. This webinar will explore ethical and privacy implications of corporate diversity and inclusion activities, with a focus on GDPR restrictions and requirements. We will discuss some best practice solutions for developing and implementing global diversity and inclusion initiatives that protect worker and applicant privacy while enabling companies to understand and enhance diversity and inclusiveness. In this session we will look at where the line is drawn between data privacy and cybersecurity. - What are the primary cybersecurity responsibilities that support effective data privacy and what falls outside of the cyber remit? -When does a suspected breach become notifiable under regulations such as the European GDPR? - What are the key tips for managing data breaches? This session will feature a range of security and privacy experts, interactive audience voting and questions from the audience will be encouraged. This webinar will explain the background of the Asia Pacific Economic Cooperation Cross-Border Privacy Rules ("APEC CBPR") framework, who is participating, and how it works, as well as how it hopes to improve privacy protections while facilitating cross-border data flows. Join this webinar to learn about the recent and possible future developments with cross-border trade and privacy in Asia, such as the Comprehensive Progressive Trans-Pacific Partnership ("CPTPP") and Regional Comprehensive Economic Partnership ("RCEP") free trade agreements, both of which have e-commerce provisions addressing cross-border data. It will also talk about what companies should do if they want to participate in and benefit from this framework. There is a new data privacy law on the horizon. Companies, regardless of where they operate in the world, that process personal data of California residents will soon be subject to new privacy requirements. About a month after the E.U. General Data Protection Regulation (GDPR) went into effect on May 25th, California state signed the California Consumer Privacy Act (CCPA). CCPA goes into effect on January 1, 2020, and similarly to GDPR, it aims to give users more control over their personal data. - How is CCPA similar with GDPR? - If you are GDPR-compliant, will you automatically be CCPA-compliant? 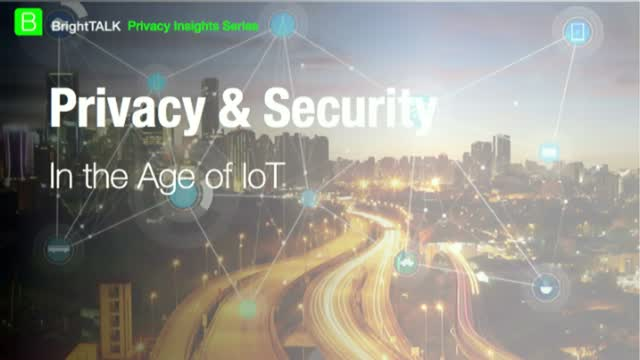 This webinar is part of BrightTALK's Privacy Insights Series. Audience members are encouraged to send questions to the speakers to be answered during the live session. The California Consumer Privacy Act (CCPA) will go into effect on January 1, 2020, providing a relatively short window for companies to prepare. While final details of the CCPA need to be sorted out by the CA Legislature, enough is known to start preparing now. Join Tom Mighell, Esq. and Greg Forest as they present a CCPA Action Plan: what specific steps you need to take to get ready. Learn all about privacy and what it means to different professionals. Discover why investing in privacy and cyber security makes business sense.